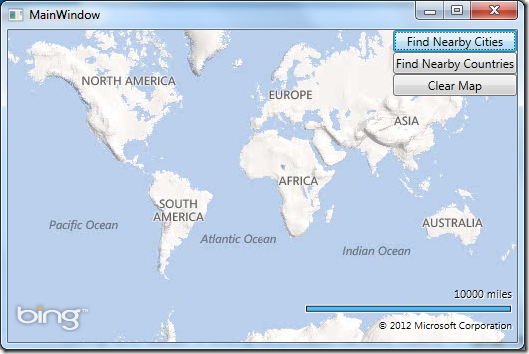 In this blog post I’ll show how to setup a basic WPF application that uses the Spatial types in EF5 with Bing Maps to load in spatial data from a SQL database that contains spatial data. To make this simple we will have a couple of buttons that, when pressed, will search for spatial data that is within 100 km of the center of the map. More complex spatial queries can be created if needed but we will keep things simple in this post. To start off we will create a WPF project in Visual Studios called BingMapsEF_WPF. Once this is loaded we will use NuGet to load in EF5 into our project. 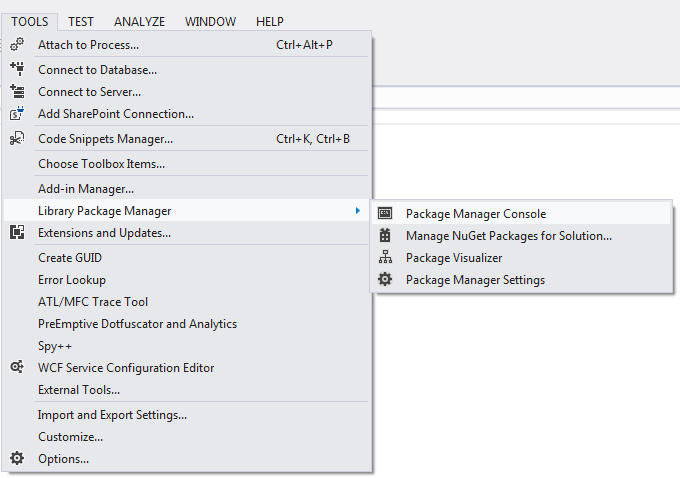 To do this you will need to go to Tools –> Library Package Manager –> Package Manager Console. This will open up a console panel. 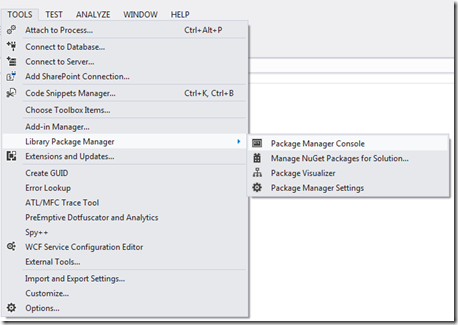 You will need to run this command: Install-Package EntityFramework –Pre Doing so should result in the Entity Framework being installed into your application. First we will need a set of spatial data to work with. 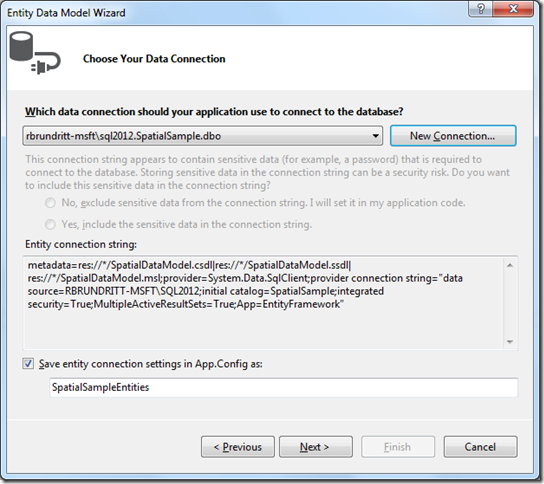 I have put together a backup of a simple database of spatial data (download – created using SQL 2012) which you can restore to your database. 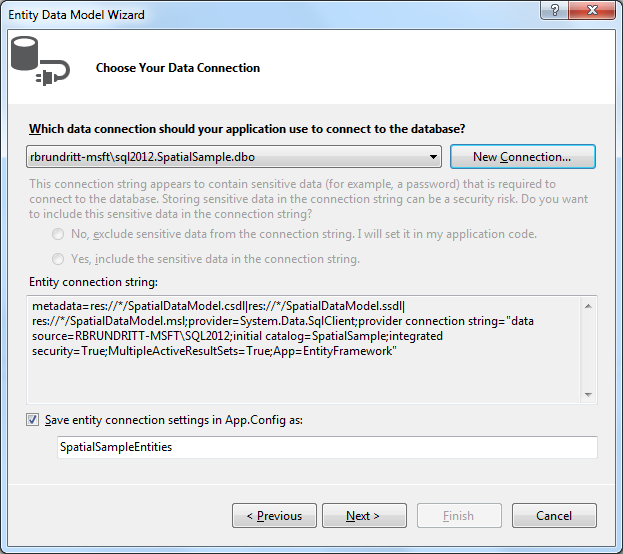 The name of the database is SpatialSample. Once you have restored the database you can create the entity model. 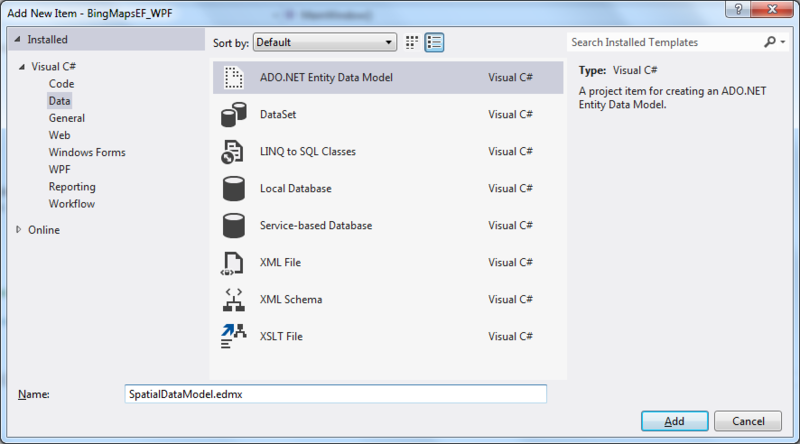 To do this add a new ADO.NET Entity Data model to the project called SpatialDataModel.edmx. On the next screen we will select Generate from database then press next. one the next screen you can connect to the sample database. Name the entities SpatialSampleEntities then press next. On the next screen you will need to select the tables from the database that you want to add to the model. Select both the Cities and the Countries tables. 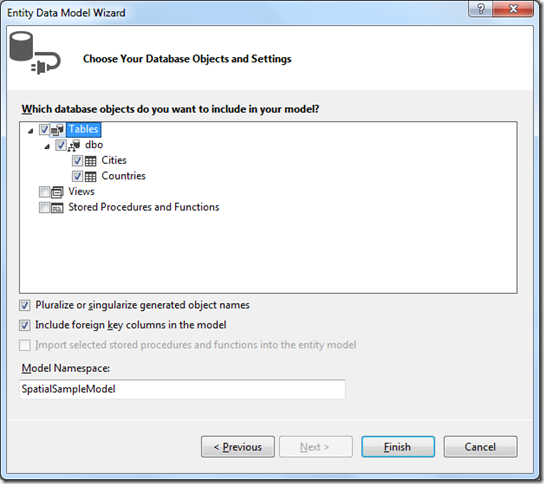 Select he model namespace to SpatialSampleModel then press Finish. Once the model is generated you should see the designer that shows the table layout. The database consists of two simple tables. The City table has a SQLGeography column called Location which contains the coordinates for a city. The Country table has a SQLGeography column called Boundary which contains the polygon data for the country boundaries. 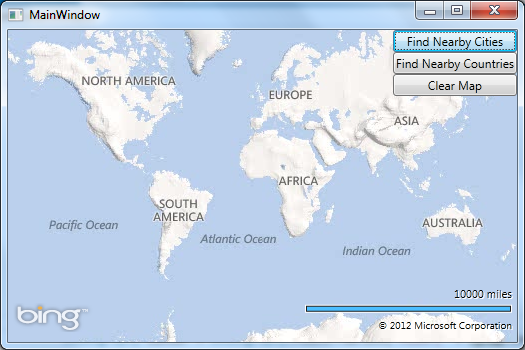 Adding a map to the WPF control is pretty straight forward. You first need to add a reference to the WPF Map control library (Microsoft.Maps.MapControl.WPF.dll) which is usually located in the C:\Program Files (x86)\Bing Maps WPF Control\V1\Libraries directory. While you are at it you might as well add a reference to the SQL Spatial Library (Microsoft.SqlServer.Types) located in the C:\Program Files (x86)\Microsoft SQL Server\110\Shared directory. This will make it easier for use to parse the geography data later, especially if you have already written code in the past that worked with the spatial types from this library. Note the 4326 value is the spatial reference identifier (SRID) for the spatial data. This defines the project system that the spatial data belongs to. 4326 is the SRID used to represent the sphere for the WGS84 projection system which is used by most online mapping API’s and by GPS’s. 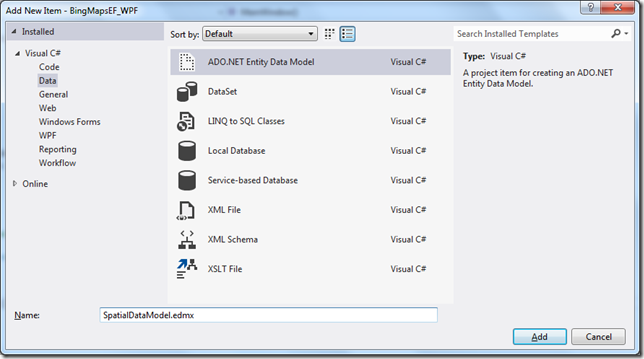 We can now use LINQ to create a simple nearby query. Essentially we want to find all locations that have a distance from the center of the map that is less than 100 km’s. Here is an example of what this type of query looks like. Once a query is done we just need to loop through each result and create a Bing Maps Shape equivalent to the DbGeography being returned in the query. To make things easier I’ll also use the SQL Spatial Types library to convert the DbGeography objects to SqlGeography objects. 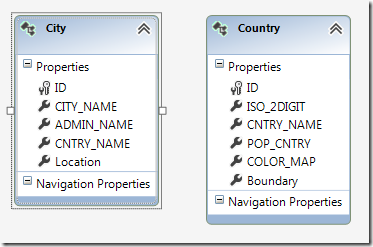 SqlGeography objects have more methods that are useful for parsing the spatial object. To keep things simple we will only add logic to support simple polygons. Polygons with holes are not currently supported in the WPF control and adding support for those is a whole other blog post for another day. Putting all this together we end up with the complete source code for the MainWindow.xaml.cs file. //Create a DbGeography object that represents the center of the map. //Add the cities to the map as pushpins. 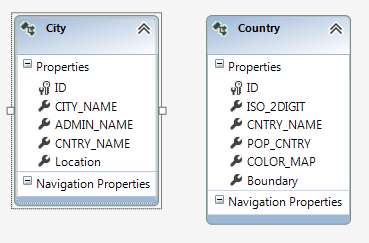 //Convert the DbGeography object to an SqlGeography object to make it easier to parse and convert into Bing Maps shapes. /// This method converts a SqlGeography object and converts it into a Bing Maps shape that can be displayed on the map. //Only render the exterior ring of the polygon for now. /// Converts a ring of points from an SQLGeography into a LocationCollection. If we run this application and navigate the map to different areas and press the nearby search buttons we will end up with maps that look like these. 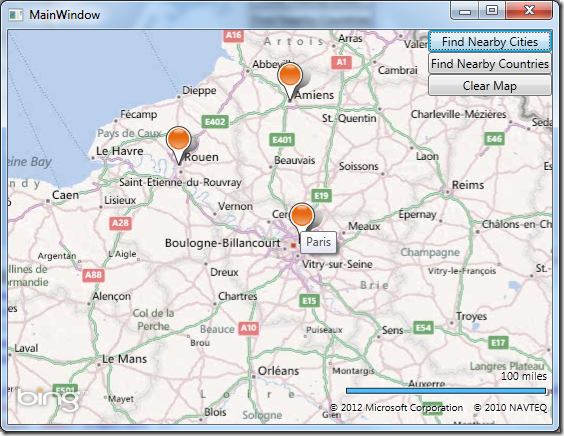 Here is an example of nearby cities being displayed on the map. Here is an example of nearby countries being displayed on the map. This post looks like my best chance at learning to use Bing Maps in WPF..
Would you please fix the SpatialSample download link?